We sent out a simple evite to family members to invite them to the party. I have seen many cute "Be our Guest" invitations as well. We used the "Be our Guest" theme for the party favors. We found favors at the party store and 99 cent store and made two sets of favors--favors for boys and favors for girls. 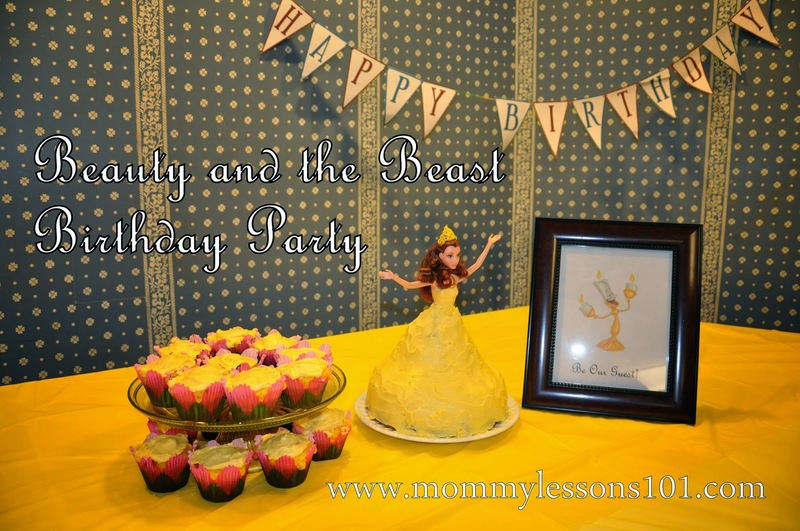 The favors for the boys had a picture of The Beast, and the favors for the girls had a picture of Belle. They all said "Thank you for being my guest!" The most popular things in the party favor bags were ring pops. We also gave out pencils, mini notebooks, princess jewelry (girls), and monster finger puppets (boys). After the party, we sent out Thank You's with a picture of my daughter at the party and the saying "Thank you for Being my Guest." We continued the "Be our Guest" theme for the decorations. I printed a simple picture of Lumiere and added the text "Be our Guest" and framed the picture to use as a centerpiece. A yellow tablecloth and princess paper goods completed the simple set up. I bought this Belle Doll as a gift for my daughter and also used her as the center of a doll cake. I made the cake by layering a bundt cake, another cake baked in a small round Pyrex bowl, and an over-sized cupcake. I removed the doll's skirt and wrapped her legs in plastic wrap and then inserted her in the center of the layered cakes. I then frosted with yellow frosting to make the cake look like a dress. You could also buy a doll dress pan if you want to simplify (Wilton Wonder Mold Kit ). But I found the layering worked just fine for my purposes. I used extra cake batter to make cupcakes and I baked the cupcakes in these cute flower liners (Wilton Yellow Petal Baking Cups, 24 Count ). When the guests arrived, we had a craft area set up for kids to bead necklaces and decorate crowns. I bought large foam beads here for the necklaces (Foam Beads 2-Lace Kit ). I picked up the cardboard crowns and stickers at the 99 cent store and party store. We also played "pin the rose" on Belle--this was just like the classic "pin the tail on the donkey" game. I used this illustration as a model to draw a picture of Belle on a poster. I left the rose off of the stem and and printed out pictures of roses for the children to try to match up to the stem Belle was holding. One final game we played was a cake-walk style game. I printed out large pictures of roses to create a "rose garden" and I numbered the roses. I then played music from Beauty and the Beast as the children danced around. I periodically stopped the music and called out a number (I used dice to decide the number, you could also create number cards to draw the number). Whoever was standing on the chosen number received a small prize. For prizes, I just used leftover items I had from putting together the party favor bags. No one felt sad in the end because after the final turn we handed out the party favors to everyone. We also served lunch as part of the party--a simple lunch of my daughter's favorites (probably most other preschoolers' favorite foods, too)--pasta, grapes, carrot sticks, rolls, and lemonade. It was a delightful party. My daughter was so adorable and excited. Best of all, we loved being with so many family members. We live away from most of the family, so it was a special treat to be able to celebrate with cousins!